Colonel John H. Fraine introduced a resolution to the North Dakota Legislative Assembly to adopt a state flag that would take the color, size and form of the regimental flag carried by the North Dakota Infantry in the Spanish American War and the Phillipine Island Insurrection. The only exception was that the name of the state, North Dakota, was to be displayed on the scroll below the Bald Eagle. Introduced on January 21, 1911, his resolution was adopted by the Legislative Assembly on March 3, 1911. A dark blue field displays a Bald Eagle grasping an olive branch and a bundle of arrows in its claws. The eagle carries a ribbon with the words "One nation made up of many states." On its breast is a shield with thirteen stripes representing the original thirteen states. The fan-shaped design above the eagle represents the birth of the United States and included thirteen stars echoing the thirteen stripes on the shield. The red scroll below the eagle displays the state name, North Dakota. A bill to change the state flag because it too closely resembled the Coat of Arms of the United States and was not particularly symbolic of North Dakota was introduced and defeated in 1953. The following information was excerpted from the 2007 North Dakota Century Code , Title 54, Chapter 54-02. 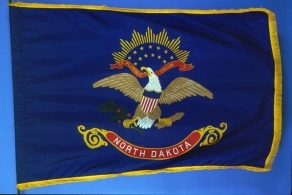 The flag of North Dakota must consist of a field of blue silk or material which will withstand the elements four feet four inches [132.08 centimeters] on the pike and five feet six inches [167.64 centimeters] on the fly, with a border of knotted yellow fringe two and one-half inches [6.35 centimeters] wide. On each side of said flag in the center thereof, must be embroidered or stamped an eagle with outspread wings and with opened beak. The eagle must be three feet four inches [101.6 centimeters] from tip to tip of wing, and one foot ten inches [55.88 centimeters] from top of head to bottom of olive branch hereinafter described. The left foot of the eagle shall grasp a sheaf of arrows, the right foot shall grasp an olive branch showing three red berries. On the breast of the eagle must be displayed a shield, the lower part showing seven red and six white stripes placed alternately. Through the open beak of the eagle must pass a scroll bearing the words "E Pluribus Unum". Beneath the eagle there must be a scroll on which must be borne the words "North Dakota". Over the scroll carried through the eagle's beak must be shown thirteen five-pointed stars, the whole device being surmounted by a sunburst. The flag must conform in all respects as to color, form, size, and device with the regimental flag carried by the First North Dakota Infantry in the Spanish American War and Philippine Insurrection, except in the words shown on the scroll below the eagle. Source: North Dakota Legislature, North Dakota Century Code, , October 31, 2007. North Dakota (U.S.): FOTW "Flags of the World" Web Site.